The design for what will be the tallest building around Kings Cross have been submitted to Camden council. If approved, it should be completed by 2013. 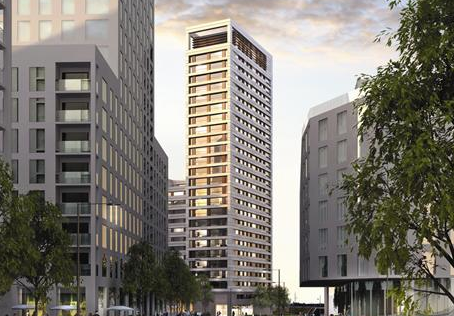 The building is arranged in two parts, with a 14-storey main block and a 27-storey tower that will top out at 100m; ominously, the developer hopes the tower will be an "urban marker" for the Kings Cross Central scheme. It is designed to accommodate students at Central Saint Martins when the college re-locates to the area. As student housing goes it's no great shakes, but externally is less garish than the two Nido towers located a little way up Pentonville Road. The area around Kings Cross will change dramatically over the next few years. The station will get a new concourse, there will be a plaza built out front, and an old gasholder just north of the station will be transformed into a event space.